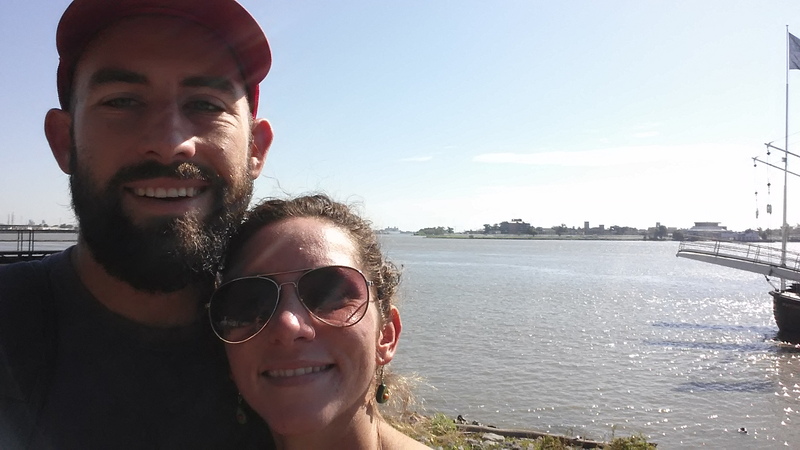 Last weekend, Brice and I took a trip to NOLA for a triathlon and some exploration of the city on the side. 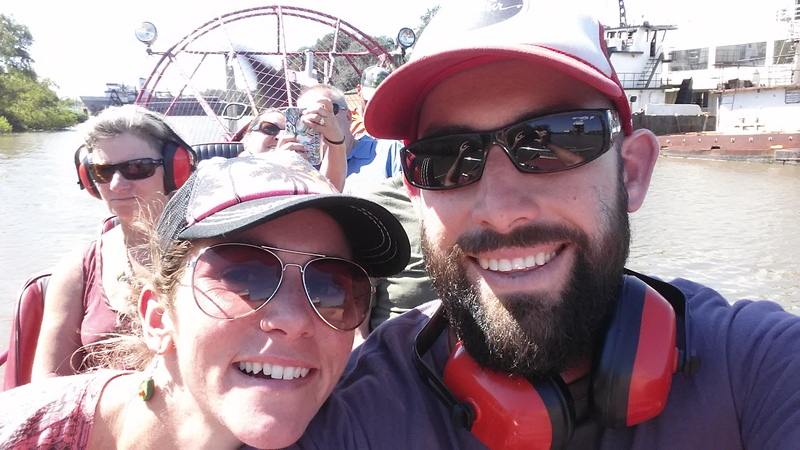 This was pretty much the end of my race season, and it was fun to end it with a mini vacation–a prequel to our not-so-mini vacation coming up next month (we are going Down Unda!). 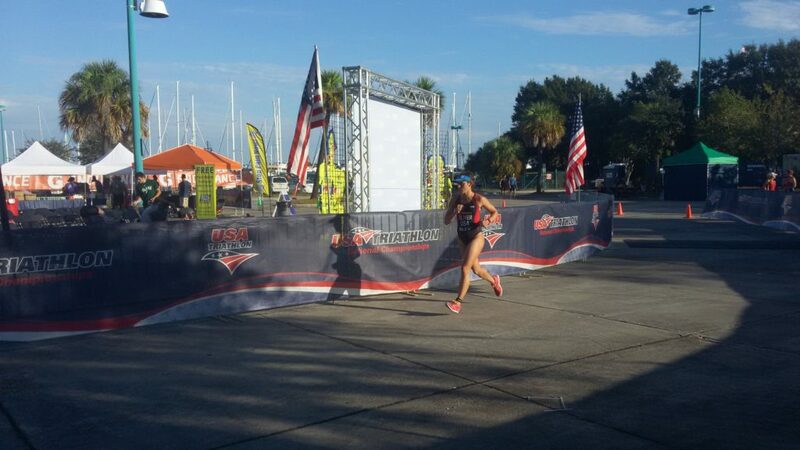 I didn’t have the race of my dreams, but I did meet some of my goals and gain some good experience. The days leading up to this race were weird. I tried to practice my usual visualization and mental preparation stuff, but just thinking of the race made my heart race and adrenaline skyrocket. I felt unusually amped up and anxious/nervous/excited. While I normally can handle 2-3 cups of coffee without any jitters, suddenly one cup of coffee would give me the shakes. I was also super sensitive to alcohol– a sip or two of wine felt like poison. I thought I might be getting sick, so I pounded Emergen-C and drank lots of fluids. The jitters, high heart rate, and adrenal response did not disappear until I dove into South Shore Harbor on race morning. Only then could I turn my nervous energy into focus and work. The swim was warm (about 80 degrees!) and non-wetsuit (my favorite!). We got to dive from 5-feet above the water, which added some extra excitement. 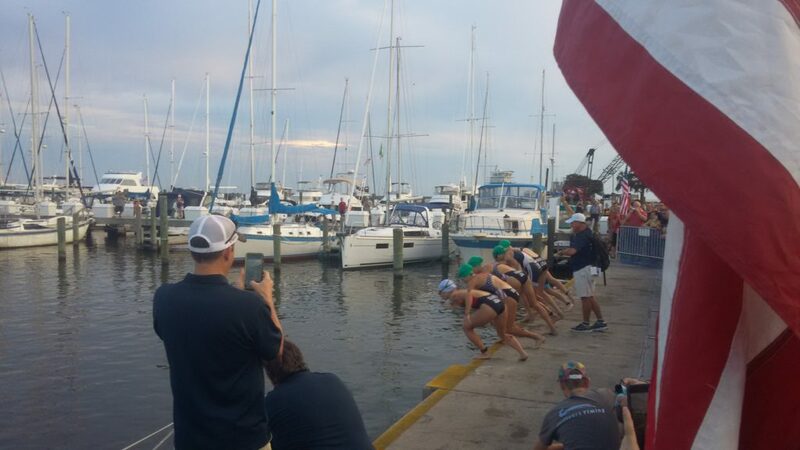 I felt much stronger and controlled in this swim than in my previous swims of draft-legal races (Clermont/Sarasota). Maybe that’s because I have actually been swimming more than 3,000 yards per week now! Even though I don’t feel like I have been going significantly faster in my swim training, adding in some good volume has given me a solid foundation to work with. Back in March, I started my races feeling strong but about 200m into the swim would feel like I was drowning–I had no swim base to rely on whatsoever. So, I’ve learned that even if I can maintain relatively good speed in the water with extremely minimal swim training, I need to exponentially increase my volume and frequency in order to maintain that speed in a race. The added training also helps my bike/run legs as I don’t go into the rest of the race so fatigued from the swim. Noted. After the swim, we climbed a cement staircase and ran to T1. Abby Levene, the eventual race winner, bolted past me and gained a good distance heading into the transition area. Another thing to work on: sprinting out of the water. Thankfully, I had a pretty smooth transition and got onto my bike quickly, while Abby seemed to have some trouble mounting her bike not far behind. The two girls who exited the water right in front of me had gotten away, so I was by myself until Abby and another woman (Alissa Doehla) caught me. We worked together to catch the two ladies up ahead. Then our group of five chased after the two leaders, who were about 30 seconds up from us. I didn’t feel awesome on the bike, but I was happy just to stick with it mentally and not get dropped. Once we caught the leaders, at a little over halfway, the pace seemed to mellow out, but there were a couple of surges mixed in. We all came off the bikes into T2 together. At the start of the run, I felt a giant cramp take over my abdomen. It wasn’t the usual side stitch that occasionally visits me during hard training sessions and races. It was my entire stomach–maybe it was upset from the nervousness and acidic “voo doo” building up the past few days? I focused on staying calm, breathing, and finding my own pace. I saw everyone else in the field cruising up the road, but there was one other athlete who I kept my eyes on. The gap between us got smaller and smaller until we went through a water station around mile 1. Then, just as I accidentally knocked over my water cup and apologized to the volunteer who may have gotten splashed (I didn’t look back to check), she picked up her pace–or maybe I slowed down– and the gap began to grow once more. I felt powerless to increase my pace, but stayed positive, telling myself “there is nobody behind you; you’ve got nothing to lose.” The weather was mild for New Orleans, around 80 degrees, but felt increasingly warm to my tired body. I ran in the shady parts of the course as much as possible. I finally rounded the curve for the finish and crossed the line in 7th place, about 30 seconds behind my closest competitor. After the race, I was curious about what my splits had been–especially my run split. I have been seeing huge improvements in the run training over the past few months– comfortably hitting paces that not long ago had felt much more laborious, and maintaining increasingly higher weekly run volumes than ever before, all while maintaining higher bike and swim loads. Just over one week ago, I had run a relatively comfortable 19:40 5k split in training, and followed that up with a 19:16 during the Carpinteria Triathlon. I went into this race feeling very confident that a sub 19:00 5k split was in reach. During races, I typically do not wear a watch or worry about pace. I rely on my body’s signals and go by feel. So, I had no idea what pace I ran in NOLA. I only knew that it felt pretty slow. Still, I hoped that my split was at least a little bit faster than it felt, which is sometimes the case for me. I was sad to find out that my split was 21:01, almost 2 minutes slower than my split just one week prior in a race that I had felt much less rested for. While I can think of some possible explanations for the slower-than-expected run, I think that sometimes you just have a bad day. Sometimes there is no perfect explanation as to why things go the way they do. There are factors that affect our physical performance and mental capacity during a race, but just as you can’t always pinpoint the exact formula that creates one of those rare “perfect” races, you can’t control or predict those performances that are sub-par. They just happen. I am trying to be okay with that and move on. That said, I want to learn from the obvious mistakes of my race preparation and execution. For future races, I want to avoid excess feelings of pressure and anxiety by keeping my mind off of the race approching and not making such a big deal out of “key races”. I want to treat them just like any other race and take the pressure off of myself. I want to practice race day mental strategies (i.e. visualization, positive self talk, mantras, etc) in training so that there is no need to “cram” in the mental prep during the week leading up to the race. I think this will help keep nerves at bay. Finally, I want to continue to focus on quality training to give me the confidence to go into a race knowing that I have done all that I can to have a good race rather than simply wishing for a “good” day! After the race, we explored Bourbon St. and Frenchman St. hoping to find some good jazz music to listen to. We didn’t find much, but we did see some street performers and found a good place to eat seafood. I do not recommend Bourbon St. (and neither did any of the locals!). I do recommend going to downtown NOLA, which we did the following morning. We stopped by some coffee shops and a cute little place called the New Orleans School of Cooking, where we picked up some freshly made pecan pralines–yum! 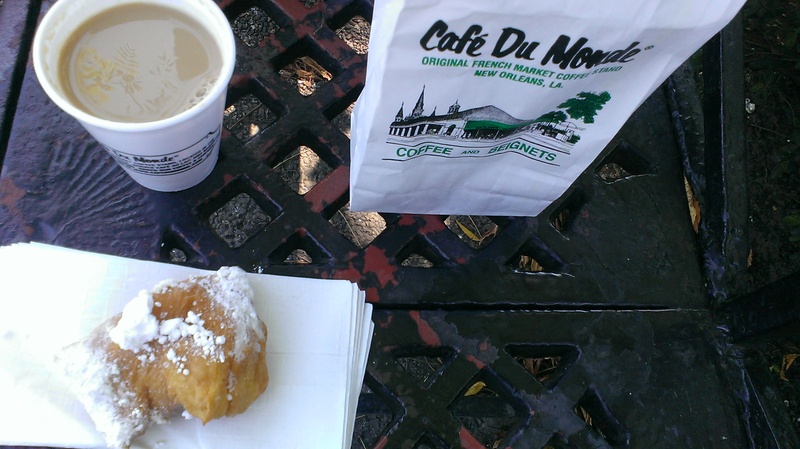 Then, we walked along the Mississippi and found the famous Cafe Du Monde. The lines were loooong! I recommend leaving plenty of time to enjoy this cute little place. We got to peek into a window and see the bakers throwing freshly rolled & cut beignet dough into the deep fryer. Mmm. The cafe is also known for its cafe au lait, which we tried both hot and frozen (think Wendy’s frosty with coffee instead of chocolate) versions of. We enjoyed our treats in the park across the street, right next to a line of horse-drawn carriages. Our last stop in NOLA was at Jean Lafitte Swamp Tours. We booked the large airboat tour, but got to ride in the smaller (more intimate, more expensive) boat because it was a slow day. We loved it and highly recommend going during the spring/summer! Our airboat captain was extremely friendly and knowledgeable about the area, history, local flora and fauna, airboat mechanics, etc. 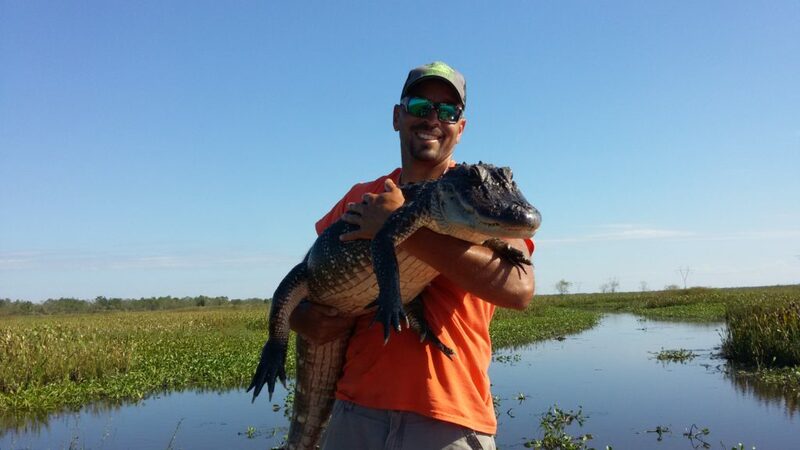 He was good friends with lots of the local alligators and even brought one up onto our boat. 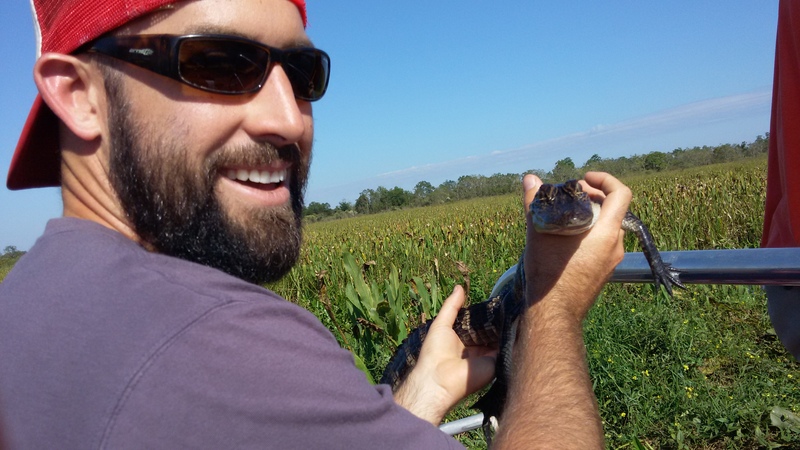 Brice got to hold a baby gator, too! Thank you to those who’ve generously supported and helped me along this season-Brice, my parents, the Olivers, the amazing Coach Gareth, Trevor and Khrystle at Metal Mountain Cycling (they fixed my broken spoke in record time during the week leading up to my last two races! ), George Galbraith and the folks at Verve Cycling for setting me up with a top-of-the-line InfoCrank power meter, and my favorite local tri/run shop Mile 26. 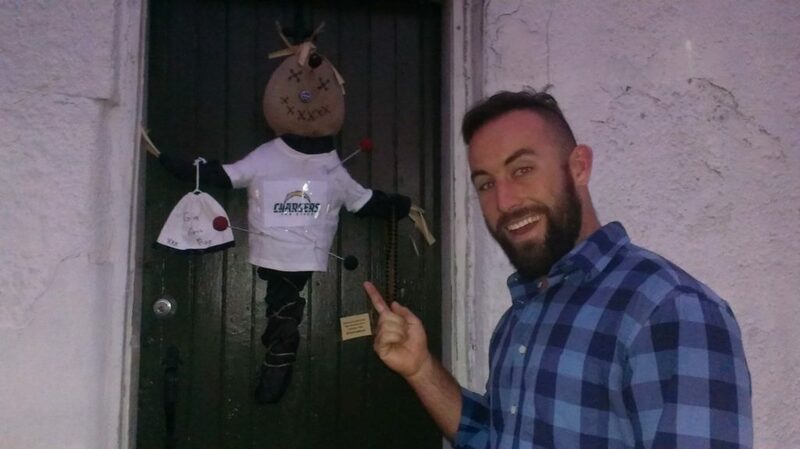 Voo doo on Bourbon St.